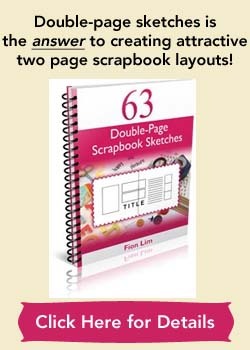 This scrapbooking idea revolves around scrapbooking three of your fears. It’s not an easy topic for some. You may choose not to think or even want to talk about them. But the fears feel real and tend to be at the back of your mind. If you let them be, they might even overwhelm you at times and cause you great anxieties. Yet for others, you may have discovered a great way to limit your fears or even overcome them. Whatever your case may be, choose three of your fears and scrapbook them. We are humans after all and each of us have a different set of fears. For me, I’ve always been afraid of death. It’s my number one fear. The thought of leaving this world forever and not seeing my loved ones for eternity scares the daylight out of me. But my faith is giving me peace of mind. 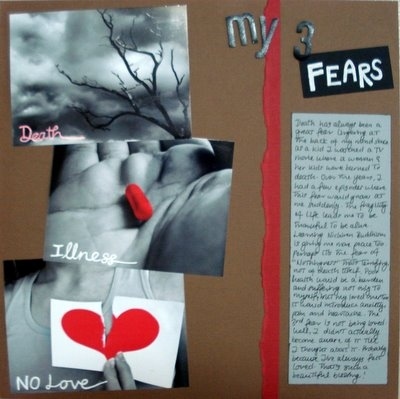 My second fear is illness. Well, it’s not uncommon to see family, friends or others suffering from poor health and the consequences an illness could reap. Not to mention how it can rob people of mobility freedom. So I’m really thankful for every day of good health I’m enjoying. Supplies used: Cardstocks – Bazzill Basics; Letter stickers – American Crafts “Thickers” Vinyl; White pen – UniBall Signo Broad “White”; Black pen – Zig Memory System “Millennium”; Black ink – Versa Color; Sketch: No. 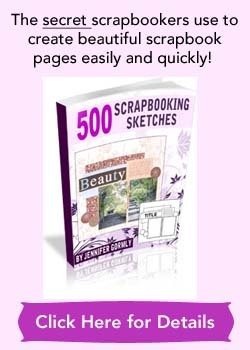 286 of 500 Scrapbooking Sketches.